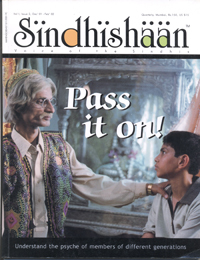 I have received two issues of “SINDHISHAAN”. The getup of the magazine is superb and the matter therein is excellent. The exclusive beauty of the magazine is this, that all the articles are Sindhyat-oriented. The younger generation who cannot read Sindhi, can be benefitted by acquiring knowledge of Sindhi culture and civilization and of Sindhi life-style after partition. You deserve all praise for bringing out such a ‘SHAANDAAR’ magazine.